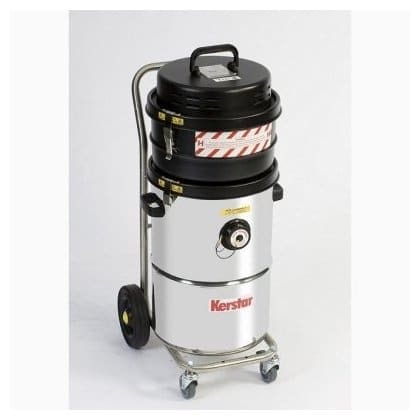 The CAV 45H industrial vacuum cleaner has a 45 litre capacity and is suitable for picking up hazardous dust and debris in gas zone 1 & dust zone 21. All CAV models are supplied on a stainless steel caddy with braked castors and conductive wheels where applicable and all models are fully earth bonded and have an anti-static (conductive) vacuum and air supply hose. Every CAV vacuum cleaner is individually tested and provided with its own test certificate for earth path continuity. All units are supplied with a complete conductive accessory kit.